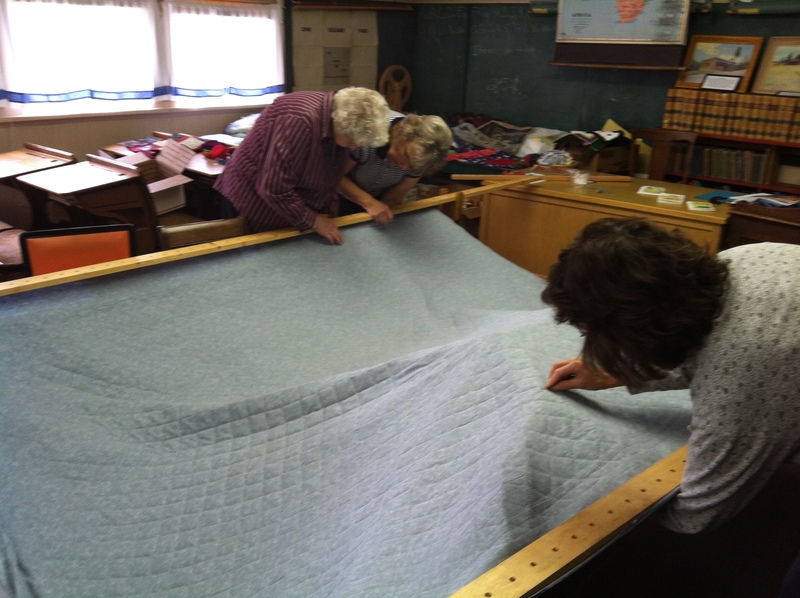 And I am behind on keeping you up to date on the Historic Village quilters. We have been busy needless to say. 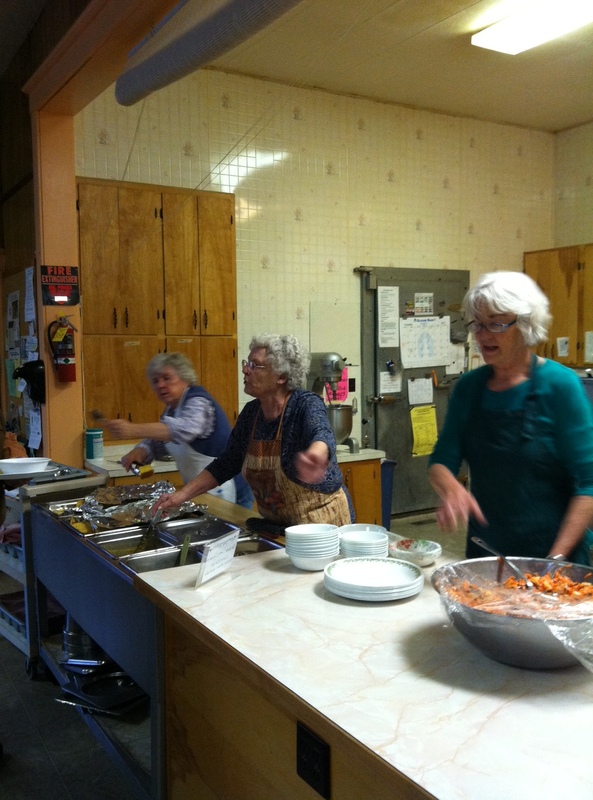 We cooked and served a delicious meal at the Community Soup night early in November. In the photo you can see Bev and Cathryn working furiously to serve up the soups (Cathy’s yummy split pea and Rita’s chicken corn chowder). Carol who isn’t a quilter came by to help. She made cornbread and helped with the serving. It was a delight to have so much help this year. Its quite the task to serve over a hundred people after cooking all afternoon. The support of the quilters and of others in the community was appreciated and made the meal go oh-so-smoothly. We finished up the postage stamp quilt. In the photo below you can see the women examining the back. This stage in the process is a bit like a final exam in a college course. How well did we do? They look for stitches that perhaps didn’t go all the way through, or knots that are showing or even sections that for whatever reason were skipped. They mark these errors with pins and then someone goes back and fixes them before the quilting part is officially completed and the binding can be done along the edges. I wish life was this easy – that at some point a wise person with a critical eye could look over the underside of my actions and point out what I missed, what was poorly done, what needed to be repaired and then give me the opportunity to repair it all before moving on to the next phase. As we go into December, everyone is making items to sell at the holiday bazaar on December 7th. You should definitely remember to stop by the old schoolhouse in the Historic Village that day (9am – 3pm) to buy some gifts for those on your list or for yourself. As usual a wonderful collection of handmade goods from embroidered pillow cases to mittens, stylish hats to meticulously quilted table runners.